Aug3: We just arrived to Karakol where I have good internet connectivity. Before I could just send updates via satellite, but no seeing comments on them, your kind words, blessings and wishes… You all have no idea of how happy I feel today, after reading ALL of them. The week has been hard, and this is just the beginning of this adventure up to the top of a difficult 7000m. THANK YOU SO MUCH for your support, now my batteries are fully charged with all your positive energy. I need to sort out some logistics in this village but I’ll reply to you all tonight! Aug4: The hotel at Karakol was like a palace, but we have to leave for 6h drive to an airstrip where a russian helicopter will take us to Khan Tengri BC! Aug5: Heli flight was delayed till this morning. We had 30 min amazing flight over Inylchek glacier to land in front of Khan Tengri, breathtaking experience!!! Aug10: Taking more food and gas up to C1. I feel very strong and want to move to C2, people advise me to rest at C1. I miss my people… Ready to rock and roll! 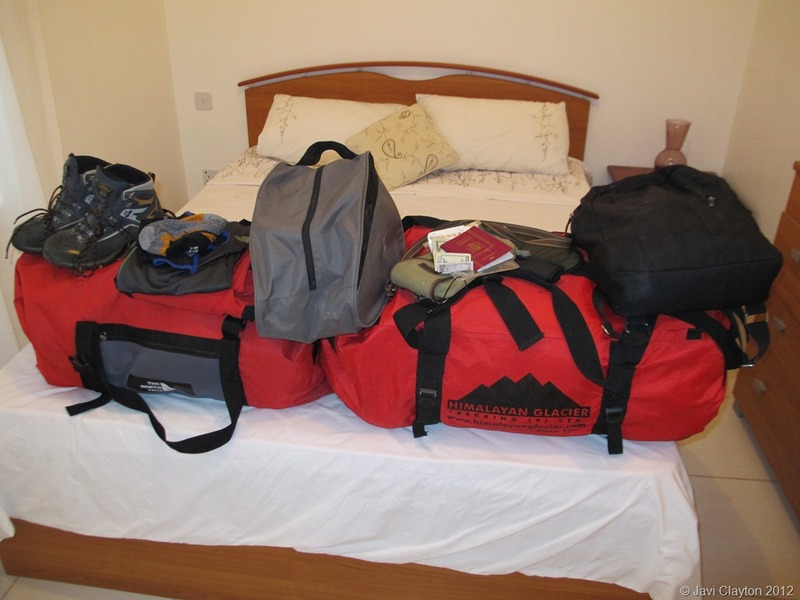 Aug11: Moving from C1 to C2 with 25kg backpack. Extremely hard 9h work. 900m technical ascent on a crest full of snow ice and rock. Smashed… but so beautiful! Aug13: Yesterday 7h of technical descent with 30+kg backpack. I had so much fun! But I was exhausted. We take the heli today escaping from storm. Game is over. Aug14: Thank you so much to everybody who sent me oxygen from the distance while I was fighting to conquer “The Lord of the Skies”. We could not get any higher than 5500m due to bad weather and avalanches which took down two austrian climbers. We had several warnings and I think we made the right decision when we got the weather forecast at Camp2. 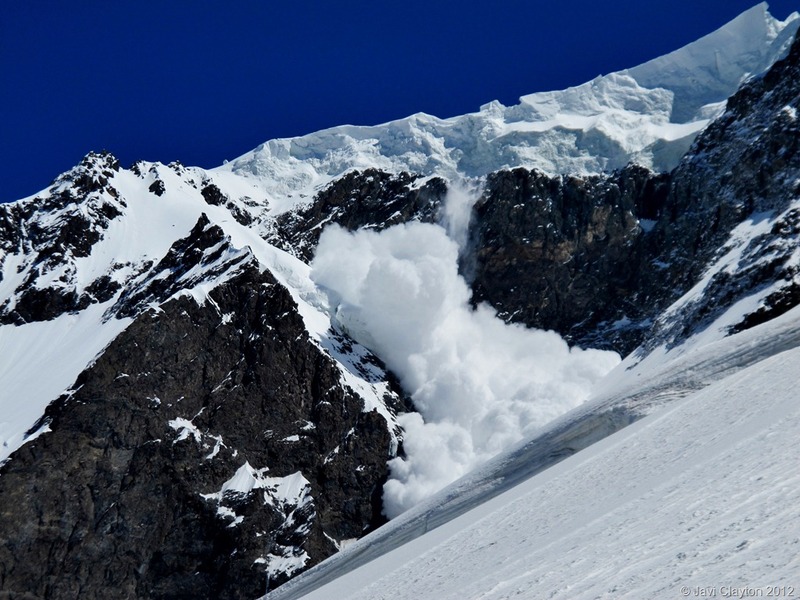 Back at the heli base we were informed Khan Tengri and Pobeda have claimed two lives this season, and several climbers were injured due to rock falling and avalanches. On the bright side of the things we are coming back home with 12 summits (four in my case) from a virgin mountain range where most peaks remain unclimbed. Aug14: Fun night yesterday eating pizza, singing karaoke and drinking vodka at Karakol. Just leaving to a resort at Issyk Kul lake to chill out for few days. 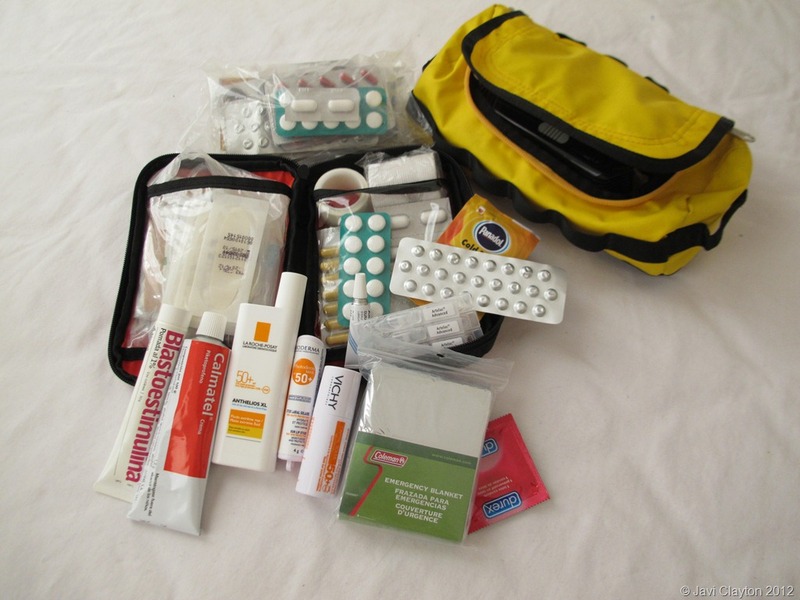 Jul21: Landed in Bishkek after a crazy and stressful day. I just met one of my climbing partners from Australia and guess what he is bringing with him… his mountain paraglider!!!! Life is full of surprises! Jul23: Last night before starting our true adventure. Tomorrow we leave Tamga to set our basecamp in the middle of a virgin area. From there the action will follow! Aug1: Today the whole team decided to rest at BC and we had a fantastic day. I went for three hours walk down the valley to photograph the wild horses, amazing! With more time in Khan Tengri and investing a big amount of time waiting for proper weather windows, we could probably have this amazing 7000m peak in our pockets. The stronger climbers in the team were those with a good climbing buddy. Conquering mountains this magnitude without a good friend covering your back, could be as challenging as I never imagined. 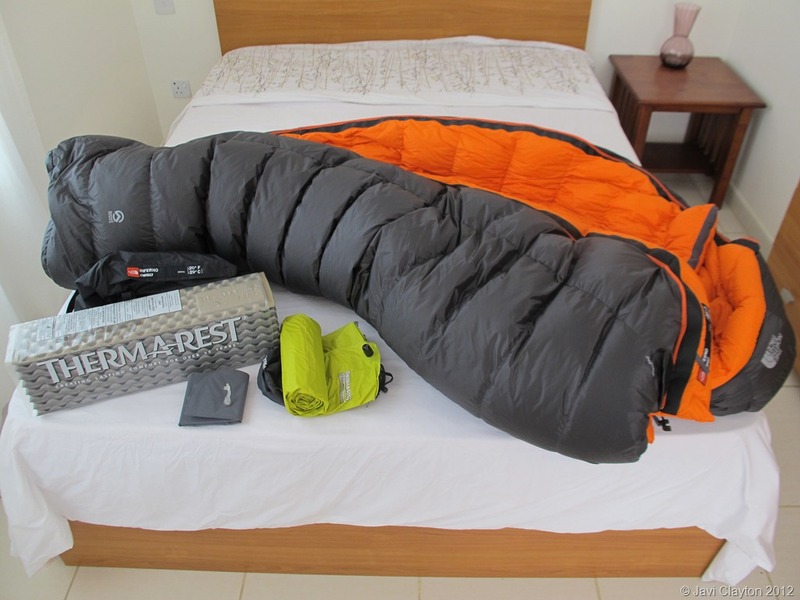 Dehydration was challenging at all times… for the next expedition use 2×1 liter insulated Nalgene bottles plus 500ml lightweight bottle to carry in my down jacket. Figure of 8 descenders are bulky and old fashion, but on icy ropes is the only way to get down. A backup ATC is light and very useful for belaying a second and self recovery. Triblocks are an amazing piece of gear as long as you don’t drop them down the hill… next time get it linked to the carabiner. Keep the gear in the harness to the bare minimum. Simplify the lanyard connecting the jumar to your harness, daisy chains are messy and not useful. The locking carabiner on the lanyard should be big and easy to action with big globes or mitts, such the Petzl Vertigo which is a via ferrata carabiner with an auto-locking mechanism that unlocks quickly and easily for frequent use. 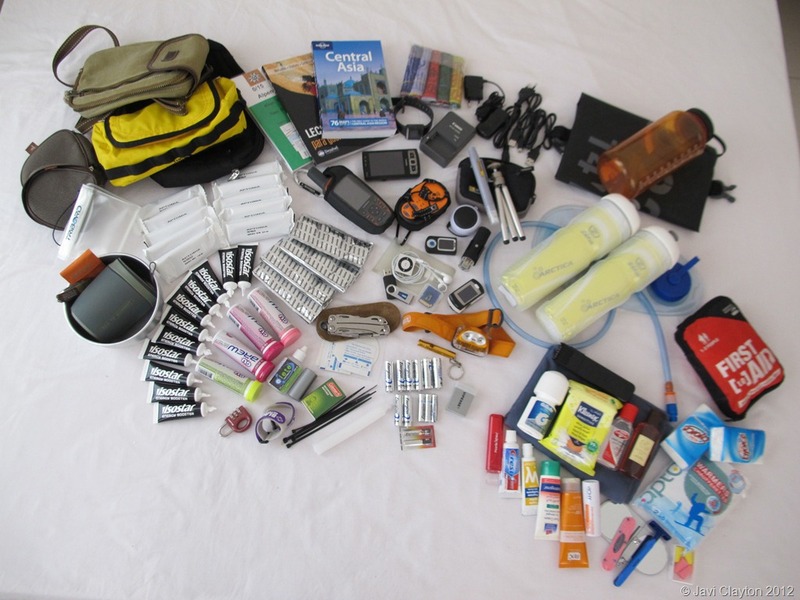 Having spare batteries for the headlamp is not enough… better to have a spare headlamp. 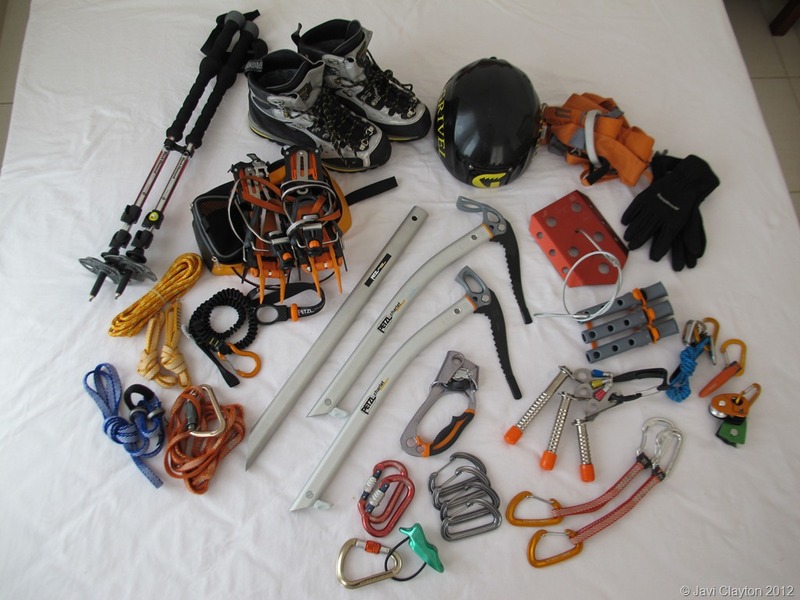 Alpine – were climbers move all the way up with absolutely all gear required to summit, and they take everything down leaving no trace of this activity, witch is consider the most pure and demanding way of climbing. 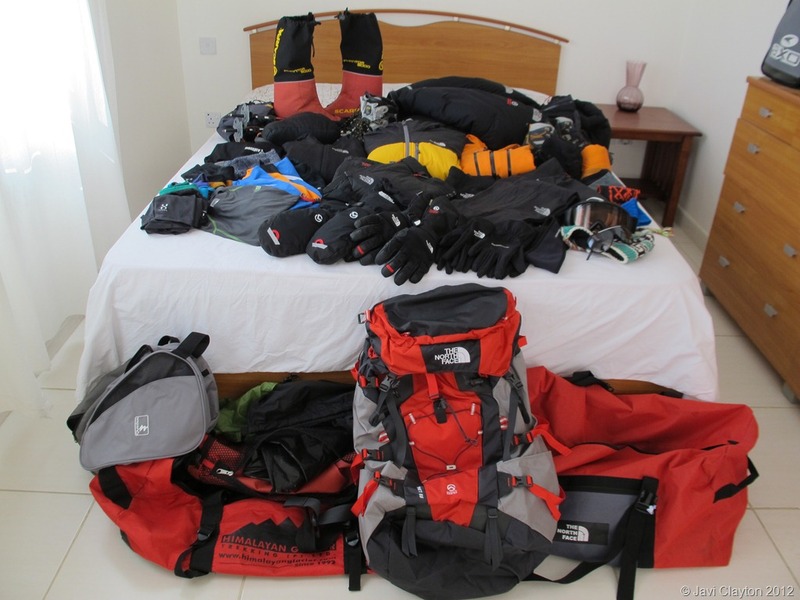 Heavy expedition – were climbers move through a number of high altitude camps that are already set up by third parties to facilitate the progression carry only personal gear. The route is normally prepared with fixed lines, aluminum ladders, bamboo markers, etc. Sherpas and High Altitude Porters are typically the ones doing the hard work while climbers focus only on moving up without the hassle of carrying heavy loads and setting up the camps. In all these three scenarios, climbers normally spend half of their time in the mountain going up and down to assess the conditions of the mountain and preparing the body for the stress of the extreme conditions and high altitude. This process is known as acclimatizing. In our case we chose a very ambition strategy. 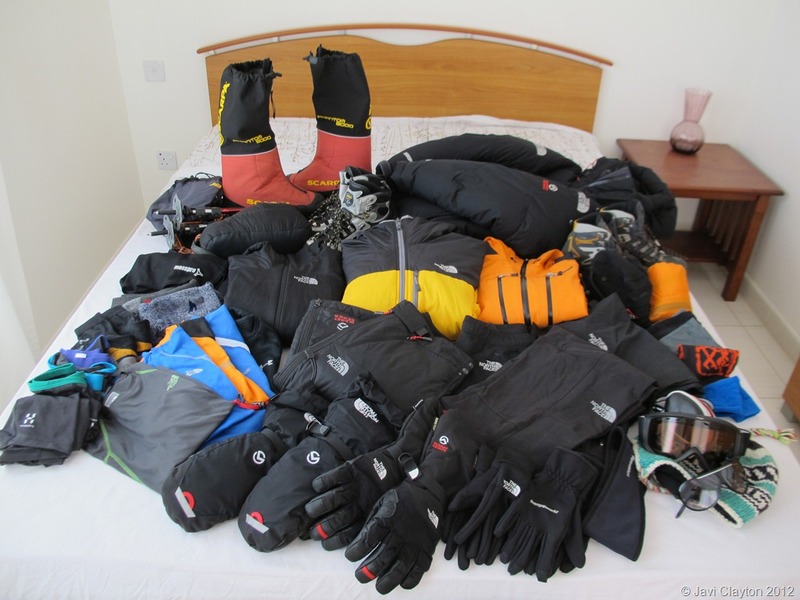 Acclimatizing by climbing alpine style for ten days in Jetim Bel Mountain Range, a remote area of the country full of virgin peaks ranging 4000 to 4800m and never climbed before by humans, and moving from there right away to Khan Tengri Base Camp in the North Inylchek Glacier to attack the mountain on capsule style. The base camps on the Northern and Southern Inylchek glaciers respectively are generally accessible by helicopter. “Generally” means the weather will be the main decisive factor to leave the Heli base at Maidadir, but I believe the rhythm of business for the company operating the flight is also determining . In the north side of Khan Tengri there are actually two basecamps, one in the Kyrgyzstan side and the other in Kazakhstan. They are about 1km away from each other, a very pleasant walk trough the glacier on rest days when you want to socialize or trade with your foreign basecamp. The Kyrgyzstan camp (4005m) is sensibly smaller and colorful, and I would personally define it as boutique style, while the one in Kazakhstan is big, chaotic, gray and military style. However the gray camp is very well provisioned with a huge mess tent featuring bar with alcoholic drinks and DJ mixer, small shop were to buy soft drinks, candy and home made marmalade, as well as Banya, the Kazakh version of a sauna. Our beautiful Kyrgyz camp had huge yellow tents were you can easily stand up, an almost new mess tent with separate quicken, shower tent with hot water for 10$, and a small toilet tent located far away from the camp and with the best views you can imagine. All tents including the toilet are set on top of wooden platforms that you have to adjust regularly to cope with the physics of the glacier. The mess tent in the gray Kazakh camp was sitting right on the icy and rocky glacier surface. Both camps have easy access to the first slopes on both easy North climbing routes. Khan Tengri was first climbed by Ukrainian alpinist M. Pogrebetskiy in 1931, from the south side which is now known as Classic Route. Since then 21 routes on four aspects of the mountain have been explored, but possibilities for new routes has not yet been exhausted. Khan Tengri can be climbed from either South or North Inylchek Glaciers, on which separate base camps are located. The “northern normal route” is more difficult than the “southern normal route”, but it is much less exposed to avalanches. It has eight different routes opened up to date, but we were looking to climb either Solomatov Route via the north east Chapaev Ridge, which take us to the summit via the West Ridge, or the Belkin Route going through the East Buttress to the North Ridge. Both routes are Russian Grade 5b and were first climbed in 1974 and 75 respectively. The route is to be chosen based on the conditions but most climbers chose the first one which is considered the Normal Route, and that is what we decided to do. 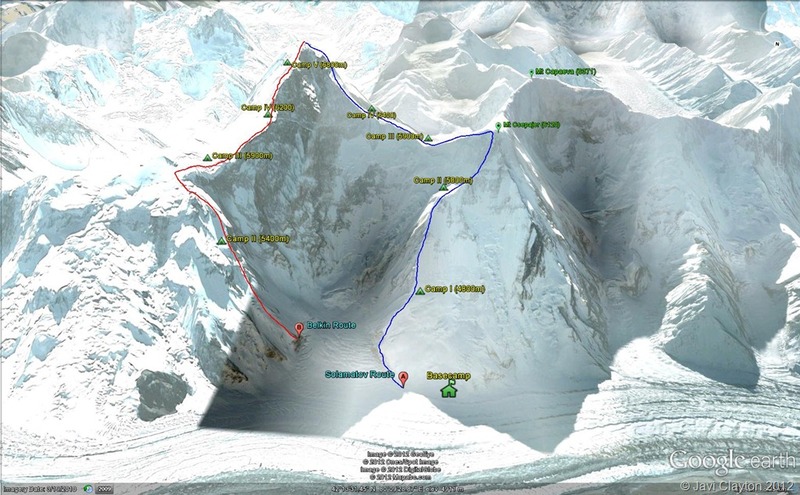 This route follows snow slopes and the NE ridge to Camp 1 (4500m). The ridge continues in a spectacular position with a couple of rocky steps to Camp 2 (5400m) situated in a glacial basin below the final summit slopes. After traversing the summit of Chapayev an easy descent leads to Camp 3 (5800m) on a col below the West ridge of Khan Tengri. This is the site of Camp 4 (6400) on the now unsafe Semenvski Glacier route from the south. It is now normal to make summit bids from Camp 3. The ascent is initially on snow slopes that soon turn into steep broken ground that gradually gets steeper as progress is made up the pyramid’s face. Much of the route now consists of fixed line, although of variable quality.